It has been alleged that the beating of a shopkeeper in Keçiören, a suburb of Ankara, for selling alcohol after 11 pm has another side: AKP discrimination against Alevis. The shopkeeper [Metin Şahin] is an Alevi living in an AKP-run neighborhood where Prime Minister Tayyip Erdogan also resides. Other Alevis have complained about discrimination and threats from the municipality and police. Alevis are a syncretistic Muslim sect whose members have often supported left-leaning parties as well as Ataturk’s secularist reforms, which Alevis hoped would free them from Sunni Muslim oppression dating back to Ottoman times. There are estimated to be around 20 million Alevis in Turkey. Many Kurds are Alevi. The mayor of Keçiören denies that there is targeting of Alevis or that alcohol is banned in his district. 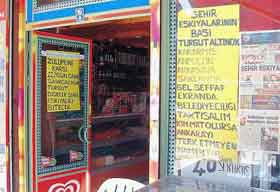 In Keçiören, with a population over 800,000, there are no restaurants selling alcoholic beverages, with a mere 163 shops selling alcohol allowed to remain open only until 11:00 p.m. In 1994, there were 14 restaurants serving alcohol, but all of them were shut down a few years after the election in 1994 of Altınok, who is affiliated with the ruling Islamic-rooted Justice and Development Party, or AKP. Locals said, however, that what was reflected in the media about the recent incident was just the tip of the iceberg of the discriminatory municipal practices. “There is a municipality-motivated polarization and discrimination in the region, which was almost divided into two sections -- where the leftists, including Alevis, are gathered and where the AKP electorate lived,” said Hacı Ali Gölpınar, an executive member of the Freedom and Democracy Party, or ÖDP, and Keçiören Solidarity Center director. Gölpınar also said the alleged “A Team,” a group of people working under the authority of the municipality, beat couples for holding hands and attacked shop owners who sold alcoholic beverage after 11:00 p.m., in order to intimidate locals. “Altınok actually is satisfied with this situation as he gives a message to his party and electorates via this event that he carries out his duty as mayor and at the same time, he paves the way for the religious and traditional customs to be maintained in his constituency area,” he added. Other shop owners, who wished to be anonymous, also complained about the municipality's rules that shops that do not sell alcohol are allowed to stay open after midnight, while those who sell alcohol are forced to close their doors at 11:00 p.m.
Altınok meanwhile refuted the allegations yesterday and said he did not confirm the incident. He said the municipality had terminated the employment of the municipal police and the prosecutor had launched an investigation into the action. The case was an individual incident. For Altınok's take on the allegations, click here for an article in Today's Zaman. With the Keçiören community so polarized, and with national press coverage of these events so infused with the usual strong political bias, it is difficult to ascertain just what happened. However, again, AKP is faced with difficult questions in regard to their treatment of Alevis and, again, I would feel much more able to dismiss these as accusations made in a singular instance if it were not for AKP's documented discrimination of Alevis in other areas of public and religious life. For more, see July 23 and June 16 posts.